When people, usually with a family history of allergy, are repeatedly exposed to house dust mite (HDM) droppings they can develop a sensitivity to the digestive enzymes found in the droppings. 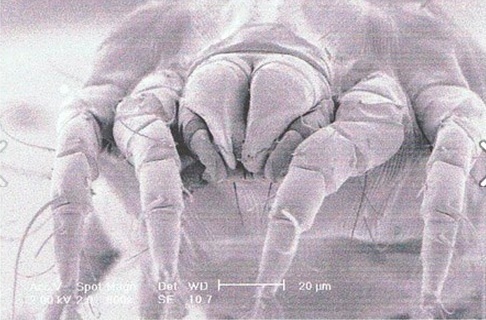 If mite exposure continues, and their immune system consider the enzymes harmful, they risk developing house dust mite related allergic diseases of asthma, rhinitis, atopic dermatitis (eczema) and conjunctivitis. Allergic diseases caused by house dust mites are asthma, atopic dermatitis (eczema), and chronic rhinitis. Once diagnosed, then house dust mite avoidance is essential. Here is a warning from Professor John Price, Asthma UK, "If house dust mite allergic asthmatics don't avoid the mite - their asthma can get worse". Rhinitis is a good example of how mites can not only cause and trigger chronic allergic disease, but also reduce quality of life. Initial contact with mite droppings may have resulted in annoying symptoms of repeated sneezing or a constantly runny nose. Further exposure can lead to a permanently stuffy or 'bunged-up' nose and loss of the sense of smell. Once chronic symptoms such as these become established, it is difficult to tell when further allergen exposure takes place because the allergic reactions are joined in one long symptom that in turn reduces the quality of life. Chronic allergic rhinitis is a known risk factor for the development of asthma and can also lead to otitis media in children. Otitis media has been described as a malfunction of the Eustachian tube which can be induced by allergic reactions, reducing the body's ability to clear mucus. Glue ear can result. The term major allergens means that most mite allergic patients react to these allergens.